If you've used editors like Notepad++ for programming you must've noticed how helpful it is to have the indentation lines displayed. Especially when programming in Python where we have indentation-based scopes. I missed this in Eclipse and this often resulted in silly bugs which were the result of incorrectly indented lines of code resulting in an incorrect scope. This is where EditBox comes in. 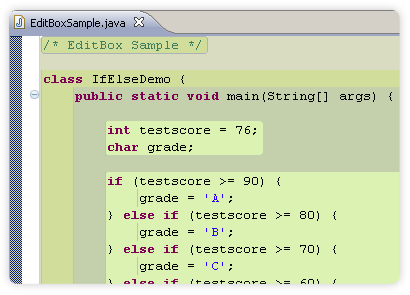 It is a plugin for Eclipse which encapsulates all code within the same indentation-level/scope into a single colored block. If you do not want the colors, it also provides simple indentation lines (like Notepadd++). Download plugin jar file into Eclipse dropins or plugins directory. To enable Editbox press the button located on the toolbar. Note: Depending on your configuration it might be required to turn off current line highlighting (see Window->Preferences->EditBox). Is this possible to make for Notepad++?